Heat oven to 400ºF. Spray tortillas on both sides with nonstick cooking spray. Place on baking sheet. Bake 5 to 7 minutes or until crisp. In medium bowl, mix chicken, cilantro, sour cream, mayonnaise, seasoning mix and onion. Place 1 tortilla on each dinner plate. Top each with 1 1/2 cups shredded lettuce. 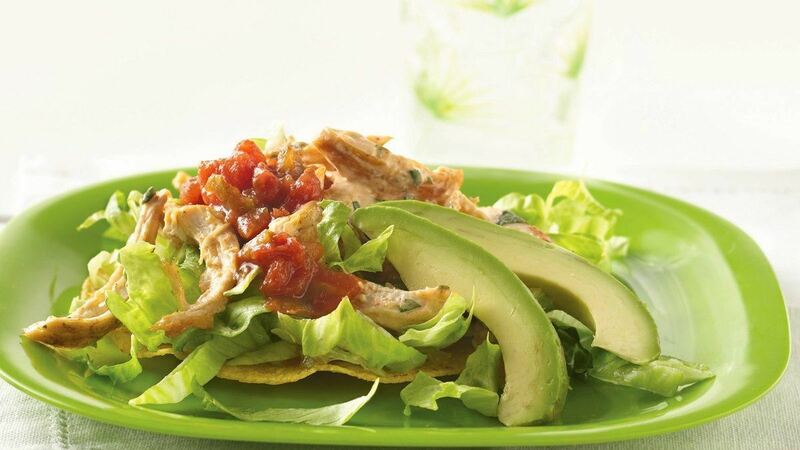 Top each with half of chicken mixture; drizzle each with 2 tablespoons salsa. Garnish with avocado. Tip : Freeze left over tortillas. Put wax paper between each tortilla and wrap well. Tip : If you're not a fan of cilantro, simply leave it out.